From Divine Design by Betsy Stang, certified Feng Shui consultant. Red is not just for Santa! Red is the color of warmth, of fire, of yang. It is the antidote for the cold yin nights of winter. Warm your nights with just the right chi by practicing these feng shui tips for winter colors, light, warmth, safety and sharing. 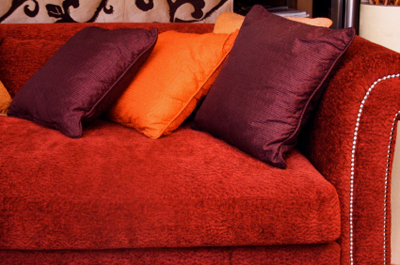 Replace some of your summer blues with reds and oranges. Think pillows, quilts and place settings. You will feel warmer and less depressed. A cozy red or burgundy throw on the chair or on the bed will make you feel wonderful, and cut down on the need to turn up the heat. Get at least one full spectrum light for a reading area. The complete spectrum will relieve seasonal affective disorder and help your eyes. Plants love full spectrum light so you can put some greenery nearby, and create a small winter garden that will cheer you up and help provide oxygen for your rooms. Long evenings mean it is time to replace light bulbs. Think energy conserving compact fluorescents, especially for outside lights and accent areas. Your pocket book and your planet will thank you. There are even energy conserving Christmas lights that are now standard in Canada. Solar path lights won’t go all night at this time of year, but they probably are on sale and will light your way home in the evening with no strain on the environment. Additionally, in February, as the days lengthen, they will glitter most of the night, even in the snow, and will make you smile for years to come. Warm up your Windows . Check to make sure all windows shut well. If you have single paned glass which lets the cold wind into the house, find some cheerful thick fabric, valances or drapes, which can cut your heating costs all winter and is a terrific way to change the feel of a room. The Victorians covered their windows for a reason; their homes were drafty! When you feel an uncovered window on a cold night, it’s cold! So think warm and add fabric. Remove or cover your air conditioners. If removal is difficult get some wonderful natural fabric from your local fabric store and create a cover. Tip: Double-sided Velcro is amazing for the sewing challenged! Watch For Fire Get the chimney ready for Santa. It is the time to have your boiler and fireplace checked and cleaned. Too many house fires or clogged boilers are caused by the lack of taking this step. All combustible materials create residue which in time builds up, so be safe, be warm and be pro-active. This expense could save you thousands. Remove any dangerously slippery bath mat. The backing does disintegrate, and think about a cozy rug for your bedroom or sitting area. Please think about natural materials so you are not creating a toxic environment. Artificial rugs off-gas and pollute a closed environment; you could expose yourself and your family to illnesses. Look for Tibetan or other tribal rugs made from natural fiber and plant dyes. Get some good books. The wintertime has always been storytelling time among all traditions, so let the indoor time give you a chance to expand your mind, either for sheer pleasure or to learn something new you have been meaning to get to but haven't had the chance. Lastly, share your home with your friends. Long winter evenings are great for sharing food and conversation. Being with those you love will remind you of how much you have to be grateful for. And as your gratitude increases take some of your old clothing and household goods to a local shelter or Goodwill and spread some cheer around. You will also get rid of your clutter and make room for the new. Chinese New Year heralds the beginning of spring in the Northern hemisphere. In the southern states the flowers begin to bloom, the rains come, often violently as the yin and yang cold and hot fight for dominance. In the Northern states often fog will settle in for long periods as the rain and snow take turns on which form of water rules. Mid winter is a good time for pruning and clearing. As the sap starts to flow upward, what shape do you want your life to take in the coming months. This is not a time for glamour and glitz. You won’t be getting by on a good idea or a pretty smile. What is the substance behind the dazzle? Expect to be called on for what you stand for. It is a great time to look at your core values. What is important to you? Have you been putting your energy where your heart really is? Rats are pack animals, so look at your pack, your friend, family co-workers. How can you be more harmonious in your relationships? Have you reached out to those who are important to you in support and encouragement? Right now a small word and small gestures can make a lot of difference.. If you did not clean out your closets at the January New Year, do it now. Try clothing on, if you don’t love it, pass it along. I sometimes do swap parties with my friends and it’s a great way to perk up a dreary February afternoon. Pass along what your friends don’t want to the nearest women’s shelter or Salvation Army drop box. Somebody needs the clothing you don’t, and you will be spreading abundance and allowing for more to come your way. Also go through the cupboards and restock for emergencies and give food with approaching expiration dates to your local food pantry. Old grain should be put out as well or you might be visited by those pesky grain moths. When was the last time you fertilized your plant?. The growing season is coming on quickly and the new moon, new year is a great time to fertilize. If you have been composting, you might spread that around now, although if the Earth is still frozen, wait until the next new moon. Since it is an Earth year, it will be a time of gradual progress. It is one of those times that we get to learn patience like the farmer who must wait for harvest for his crops to be ready. This year short cuts won’t work but hard work and perseverance will further. In a society that values short term results, this is a challenging aspect. However, earth signs, like Taurus, Capricorn and Virgo will be in their element as well as those born in the last year of the Earth Rat, February 1948 – January 1949. Focus your changes on the center of your home, this section represents the Earth element as well as your health. Get that check up you have been postponing, you might find you can stop a problem before it gets big. It is also a good time to get better nutrition. This is an especially good year to eat as organic as you can. If your stove is not working well, its time to fix it, especially if you are having cash flow problems. Take small steps in your life to begin to bring about big growth later on. Those of you who have been afraid of change, it is your time to shine. It is a time of setting foundations, of planting who you want to become. To everything there is a season.